Barcelona is a city that can really be said to have everything, and EADA’s central location in the vibrant and cosmopolitan city of Barcelona can only be an advantage to its participants. According to Cushman & Wakefield’s survey of international companies, Barcelona ranks among the top five best European cities for business today. Key factors in the companies’ rating included easy access to customers/clients, availability of quality staff, effective telecommunications networks and transport links with other cities. 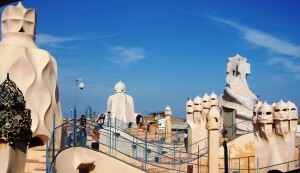 Barcelona was also ranked the number 1 city in terms of quality of life for employees. Reasonable rental prices make it possible to live in the safe and attractive zone of Eixample (where EADA is located), as well as in other nearby “barrios” (neighbourhoods). As EADA is close to the centre, participants can live around the corner from school while still being in the heart of the city. For those who live in a different area of the city, the efficient and reasonably-priced transport system makes the city ideal to navigate by metro and bus, while the ever-growing network of bicycle lanes is a safe and healthy alternative. Two thousand years of history have left their mark on the city in its architectural, artistic and cultural heritage. EADA finds itself in the privileged position of being located within walking distance of Gaudí’s famous Casa Batlló and Casa Pedralbes. It also neighbours numerous art galleries (internationally renowned and boutique galleries), as well as being within 20 minutes of the gothic quarter, the oldest part of the city and home of the Cathedral. The climate and geography of Barcelona encourage participants to make the most of the time they do not spend studying. Sun, sea and mountains provide interesting excursions, all well served by public transport. As a city on the Mediterranean coast, Barcelona has a warm, humid and sunny climate ideal for outdoor activities, while the Pyrenees Mountains are within easy reach.